The liner notes that accompany this collection note that '70s soul music has never really gotten its due. 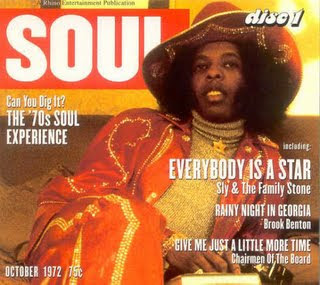 One could argue that point for days, but hubris aside, there's no denying that Can You Dig It pays serious homage to the golden years of American soul. The new box set contains 6 CDs and 136 cuts, 65 of which hit the No. 1 spot on the R&B and/or pop charts. As you'd expect with a project that mines such a rich era (the CDs are compiled chronologically), it represents a who's who of stars. Among the notables: Marvin Gaye, Sly Stone, Curtis Mayfield, the Spinners, the O'Jays, the Staple Singers, James Brown, Chairmen of the Board, Laura Lee, Freda Payne, and Jean Knight. Lesser lights also get to shine, i.e., El Chicano, who deliver the salsafied hippie anthem "Tell Her She's Lovely." But let's be honest--the selling point is the hits, and from the uplifting "Ooh Child" to the sassy "Want Ads," if you grew up in the '70s (hands up), then these tracks are beloved. Sure, the hard-core fan will probably wish for more obscurities, and the exclusion of Stevie Wonder, Aretha Franklin, and George Clinton is troublesome, but anyone wanting an at-home jukebox loaded with classic R&B will certainly dig this. 11. Have You Seen Her? 4. Why Can't We Be Friends? Thanks so much for posting this amazing collection!! It might just be me, but I only got tracks 1-15 from the first disc, and tracks 16-25 seem to be missing?? Love your blogs, lotta great stuff here, thanks for all the effort! This is by far my favorite soul collection. I did grow up in the seventies, and there's a golden empire of memories and treasures within these discs, thanks a million! As Red Dragon says, though, Disc One is missing the last ten tracks. Any chance of re-upping that one, please? Love all your great stuff! Can You Dig It?!! Hey, thanks a lot for this incredible and high quality music vault! I would like to point that in the last disk (#6) the second track on the zip is Charles Whright's "Express Yourself" though it should be B.T. Express' "Express". Is this correct? Is it possible to upload just that song or is it better to re-up disc 6 altogether?